Bone needles are one of those things that are a useful part of any experimental kit. They are easy to make, durable, and work better for sewing leather and hide than many steel needles. If they do break, then it’s easy enough to cut off a new bit, drill a hole and sand it down to a glossy, slender tool. The best bones to use are the long bones, a humerus or femur. Recently a particular bone needle made the news. 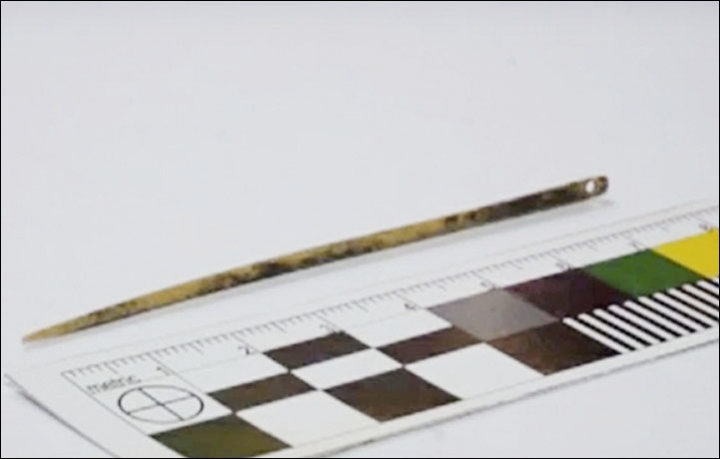 A 7 cm needle made from a bird bone was found during an excavation in the Altai Mountains in Russia. You can read the full article here. Finding a needle in an excavation is difficult enough, but finding one intact after 50,000 years is extraordinary. However, in this context this needle is much more than just a needle. First we must think about the technology and tools that went into making the needle. It had to be cut and shaped with stone tools, and then there’s drilling out the eye. Once we start thinking about making something as simple as a needle, suddenly an entire toolkit for making needles appears, and then there’s the other direction: how was the needle used and what was it used for? Materials such as leather, string, and textile rarely survive in the archaeological record. Could the Denisovans have been sewing hides into clothes? Making shoes? Sewing smaller skins into something larger such as blankets or tents? Did they sew these together with sinew or hair, or cord made from plant fibre? A world of missing material culture suddenly becomes imaginable. Small things like this needle should put to rest the image of the “caveman” with ragged animal skins. These people were likely to have been sewing clothing!